Matt Riddle got back to his winning ways after suffering his first professional loss against Nick Osipczak last August. Using his relentless take down ability and smothering top control, Riddle frustrated Soto for two and a half rounds. Soto never really was able to offer anything offensively, while spending most of the fight on his back. Even on the feet, Riddle was able to get the better of the exchanges using the clinch to deliver big knees to the legs and body. The fight came to an end in the third round after Soto landed an illegal up kick to the jaw of Riddle. The ringside doctor stopped the fight even though Riddle wanted to continue. Matthew Riddle was awarded the disqualification victory, but he was well on his way to earning the unanimous decision victory anyway. Matthew Riddle – A young talented fighter like Riddle just needs more experience in the cage more than anything. Another low-level to mid-range welterweight is in store for Riddle. Somebody like Jake Ellenberger, Matt Brown, or Brian Foster would be formidable next opponent. Greg Soto – Usually UFC-newcomer’s get two chances inside the octagon to get a win, but I’m not sure if Soto will be given that second look. He was dominated for the length of the fight, and then had the disqualification to top it off. If he is brought back for another bout, he will most likely be put up against somebody fighting for their UFC career as well. Examples include Daniel Roberts, Julio Paulino, or Ricardo Funch. Jared Hamman and Rodney Wallace put on a crowd pleasing show from the first bell to the last on Saturday night. The two light heavyweights battled back and forth in all areas. In the first round, Wallace was able to get frequent take downs and throw some vicious ground and pound from the top position. Just when it looked like Wallace was cruising to earn the round, Hamman landed a head kick that sent Wallace to the mat. Wallace recovered and was able to get back to the feet only to be knocked down again with a flurry of punches right before the end of the round. The second round began in Wallace’s favor again with more take downs, but when Hamman escaped a triangle choke attempt, he dropped more devastating punches to earn him the round again. In the third round, it was Hamman with the take down and better positioning. Wallace again attempted a triangle choke and kimura from the bottom, but Hamman was able to stay out of any real danger to secure him the victory. Each fighter earned the $65K “Fight of the Night” bonus for their troubles. Jared Hamman – Hamman earned another fight in the UFC with his victory in New Jersey. Most likely he’ll get another up and coming light heavyweight to see where his place in the division stands. Kyle Kingsbury, Brian Stann, or James Te Huna are possibilities. Rodney Wallace – Wallace now falls to 0-2 inside the UFC. He is definitely a possibility to be cut from the roster, but the exciting nature of his fight with Hamman may have earned him another shot. If Wallace does receive a 3rd chance inside the octagon, Igor Pokrajac or Stephan Bonnar would be possible match-ups. Drwal made a crucial mistake early that cost him the fight against the elite jiu-jitsu artist, Rousimar Palhares. Drwal attempted a head kick that was off the mark, causing him to slip and fall to the mat. Palhares quickly dove in, locked in a heel hook and forced the tap. Controversy ensued after Palhares was late on releasing the hold, even after the ref had stepped in to pull him off. Drwal was left screaming in agony on the mat, but eventually walked off on his own accord. X-ray’s since have shown there are no fractures and an MRI is scheduled soon. Palhares was suspended 90 days for disciplinary reasons. Rousimar Palhares – I expect Palhares to get a big name fight next after the quick victory at UFC 111. Nate Marquardt, Vitor Belfort, and Chael Sonnen are all without scheduled fights at the moment, and Palhares could offer a solid match-up. Tomasz Drwal – Hopefully this injury doesn’t keep him out too long. When he does come back, I see Drwal going up against a rising welterweight, ready to make a jump up the ladder. Possible options include: CB Dollaway, Goran Reljic, or Alessio Sakara. Ricardo Almeida’s first fight at 170 lbs was a successful one. Almeida completely mauled the dangerous Matt Brown by pressing him up against the cage, then dropping him with single leg take downs. Brown never had a chance to release his lethal strikes or knees due to the relentless wrestling aggression of Almeida. In the second round, Almeida opened up a large gash over the left eye of Brown. Soon after another Almeida take down and a transition to mount, Brown tried to scramble to his feet but Almeida took his back and locked in the rear naked choke for the finish. Ricardo Almeida – Almeida looked impressive in his first fight at welterweight. He showed no signs of fatigue that can be caused by the weight loss, and seemed to be just as strong. I think he can really excel in this division, due to the power and size advantage he will have over most of his opponents. He’ll be able to get smaller fighters down with sheer power, to make up for his lack of wrestling technique. I’d really like to see Almeida against one of the top guys in the division. Perhaps Dan Hardy, Mike Swick, or John Howard. Matt Brown – This wasn’t a good match-up for Brown at all. As long as he keeps putting on exciting fights, he will probably have a gatekeeper job with the UFC as long as he wants. I’d like to see a fight with Anthony Johnson next for Brown. Two exciting strikers going at it, with the winner most likely getting a large jump in competition. Nate Diaz’s first fight at welterweight was a successful one. On Saturday night, Diaz was visibly the smaller fighter but that wasn’t an issue. Diaz flustered Markham early with a flurry of punches, sending him into a retreat. Diaz then landed a knee in the clinch against the cage, dropping Markham to the floor. Diaz quickly surged in on Markham and finished the fight shortly after with another array of punches. Nate Diaz – Even though Diaz looked really good during his first bout at 170 lbs, I still believe the move up in weight is the wrong decision. Diaz struggled against the top wrestlers in the lightweight division, and they’re only going to be bigger and stronger in the welterweight division. Possible exciting fights for Diaz right now include: Chris Lytle, Dustin Hazelett, or Matt Brown. Rory Markham – I really don’t see the UFC keeping Markham after this loss. This is his second loss in a row, and he didn’t look good in either one. He came in 7 pounds heavy for his fight with Diaz, which isn’t going to help him make any friends either. Two of the best grapplers in the lightweight division, put on a clinic for the UFC fans of New Jersey. Bocek looked like the stronger fighter for most of the first round with his wrestling keeping Miller on his back for a good portion of the round. But then from the bottom, Miller locked in a deep kimura. Bocek gave up top position and Miller torqued the arm even further. Somehow Bocek survived, but the submission attempt stole the round for Miller. Bocek returned to dominating form in the second, ended up on Miller’s back with a body triangle while pinning his right arm inside the lock. Amazingly, Miller fought off any rear naked chokes attempted by Bocek with just one arm available. There was little action in the third round, but Miller ended up on the back of Bocek in the closing seconds of the fight, earning Miller the slight advantage. The judges awarded Miller with the unanimous victory, but the fight was extremely close and could have easily gone the other way. Jim Miller – With the victory, Miller is now 6-1 in the UFC and ready to face the top of the division. I’d love to see Miller take on someone like Sean Sherk, Spencer Fisher, or a rematch with Gray Maynard. Mark Bocek – Bocek, even in defeat, showed that he is still one of the top prospects in the lightweight division. A fight with Joe Lauzon or Dennis Hallman would be a solid next step in his career. Ben Saunders was brave to take a fight with Fitch on short notice, but he showed he’s not quite ready to be apart of the top echelon of the division. For three rounds Fitch dominated Saunders with unrelenting take downs, then peppered his face with brutal ground and pound. The only offense Saunders really had was an up-kick that connected flush on Fitch’s jaw late in the first round. Fitch won the one-sided unanimous decision for his 12th win inside the octagon. Jon Fitch – Fitch is now an unbelievable 12-1 in his UFC career, with his only loss to current UFC champion, Georges St. Pierre. His loss to St. Pierre was almost 2 years ago now, and Fitch is a much better fighter than he was back then. I believe Fitch is by far and large the true #1 contender for the belt, but the UFC seems completely disinterested in a Fitch/St. Pierre rematch. If the UFC doesn’t want to give Fitch another title shot, Thiago Alves seems like the only worthy match-up. Ben Saunders – Back to the real world for Saunders. He needs more fights against people around his experience level. Matt Brown, Matt Riddle, or Brian Foster would be suitable opponents. Pellegrino and Camoes put on probably the most exciting fight on the televised card. After an early scramble, Camoes took the back of a standing Pellegrino. Camoes locked in a rear naked choke, but Pellegrino remained calm. Pellegrino ended up spiking Camoes face first into the mat, which clearly dazed him. From there on out, the fight was completely controlled by Pellegrino. In the second round, Pellegrino was able to get in mount, and in a scramble took Camoes back. He sunk in the rear naked choke deep, and Camoes was forced the tap. Kurt Pellegrino – Pellegrino has now rattled off 4 wins in a row, and should get a big jump in competition. Clay Guida, Joe Stevenson, or George Sotiropolous would be interesting fights. Fabricio Camoes – Camoes is now winless in his first two fights in the UFC and usually that means an instant cut from the promotion. But due to the excitement of the fight with Pellegrino, it may have earned him a 3rd chance. The two fighters started off very tentative, but Carwin ended up getting the better positioning in the clinch game. Still there was little offense between the two until Carwin landed a left uppercut that stunned Mir. Carwin then followed that up with about 10 uncontested uppercuts that landed to the jaw of Mir before he dropped to the canvas. Mir grabbed an arm for a last minute desperation submission attempt, but Carwin kept on with the attack. After Mir was no longer protecting himself, referee Dan Miragliotta called off the fight awarding Shane Carwin the interim heavyweight title. Frank Mir – Frank Mir will probably have to wait awhile to get the chance to avenge his loss to Brock Lesnar. I’ve read Dana White isn’t very interested in a Velasquez/Dos Santos for the time being, so Mir against either one of those guys is enticing. For five rounds, Georges St Pierre put on a wrestling clinic against Hardy. 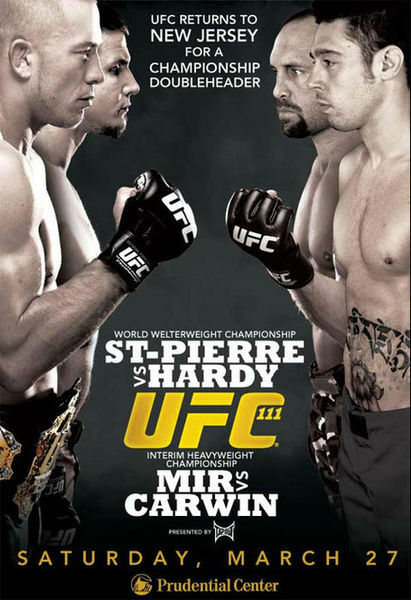 St Pierre made it very clear early on that he wasn’t going to take a chance striking with Hardy at all. Most of the fight St Pierre was in side control or half mount, looking for opportunities to finish the fight. Midway through the first round, St Pierre sunk in a deep armbar that was fully extended, but somehow Hardy was able to escape right before everyone thought his arm would snap. The other big moment in the fight was in the fourth round, when St. Pierre locked in a kimura that had Hardy’s arm completely trapped behind him. Once again, the British welterweight would not tap, and eventually escape again. For 25 minutes, St. Pierre never allowed Hardy to amount any of his offensive firepower. When it was all over, St Pierre earned the unanimous decision victory, but Dan Hardy won the respect of the entire MMA community for never giving up. Georges St. Pierre – Like I said earlier, I believe Jon Fitch should get a rematch with GSP. The UFC has other plans though… the winner of the Koscheck/Daley fight is likely to be the next opponent for the champ. Dan Hardy – Plenty of quality fights await Dan Hardy after he proved he belongs at the top of the division. Thiago Alves, Jon Fitch, and Ricardo Almeida all make for intriguing match-ups. Posted by Matt Faler on March 28, 2010 in News and Notes, UFC, What or Who's Next? Matthew Riddle def. Greg Soto via disqualification (intentional illegal upkick) – Round 3, 1:30.